Since mid 1980s, laser Rosacea treatment has been used as a perfect solution to complete cure of the disease. Intense Pulsed Light is a new technology which is now considered a better way to get rid of Rosacea. However; despite years of extensive studies, the doctors and scientists are still unable to predict the results of laser treatment on specific types of skin. The theory of laser technology in Rosacea treatment is simply and easy. Lasers are used to cure skin thickness, redness and vein webs. The laser technology is now divided on the basis of its results. Patients with skin redness and vein webs are suggested PDL. This technology increases the heat of veins, fix the broken veins and seal them from the broken areas. The results appear just after first session. However; it is seen that patients of young age tend to have bruises and rashes after PDL. These bruises last for 1 week only. The mechanism of KTP Laser and Diode Laser is similar as PDL. The only difference is that KTP Laser and Diode laser cause lesser bruising as compared to PDL. However; a shocking fact is that KTP and Diode laser are not very effective which has led scientists to believe that greater bruising results in better results. If the patient has skin redness and thickness, then he is suggested either surgery or treatment with Erbium YAG and CO2 lasers. Surgery cures thickness only but laser treatment cures Rosacea as well therefore; laser Rosacea treatment is considered better than surgery. Rhinophyma or skin thickness is a longlasting Rosacea which is a result of different causes. Erbium YAG lasers and CO2 lasers can cure initial stage Rhinophyma only. The lasers relax and soothe the veins, shrink the swollen cells and reduce the skin thickness. Generally, various other treatments are combined with laser treatment to cure Rhinophyma. IPL or Intense Pulsed Light is generally not considered among laser treatments. However; because of its resemblance in treatment procedure, most of the doctors count it among laser Rosacea treatments. In 1995, IPL was introduced for treating the damaged or dilated veins and blood vessels. Later on, it was discovered that IPL can be used to treat Rosacea problems like flushing, acne breakouts and dilated blood vessels etc. After further research and experimentation on IPL, it was discovered that Intense Pulsed Light is effective in treating Rosacea but the effect is always unpredicted i.e. the result can only be discovered after the treatment. The benefit of IPL over other laser therapies is that its side effects are temporary and it has lower level of risk. Laser treatments might be dramatically beneficial for some people and totally non-beneficial for others. 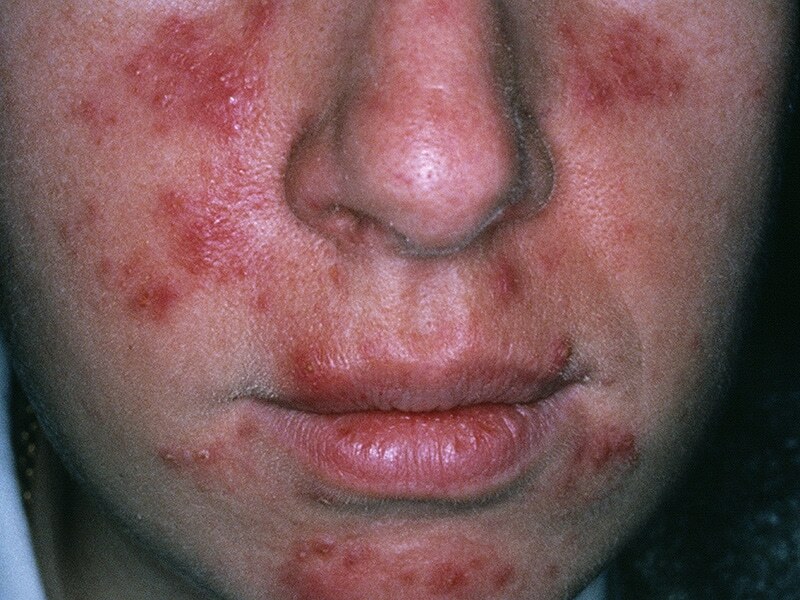 Not all patients of Rosacea are good candidates of laser Rosacea treatment. Factors like insulin dependent, clotting disorder, sun tan and vulnerability to keloids development might worsen Rosacea after laser treatment. A non-experienced surgeon is the biggest danger to your Rosacea. You should select your doctor after complete research and reference collection. Unfortunately, laser treatments do not come under categories of insurance. You will need to spend more than $300 for each session. 1 to 6 sessions are required for complete cure. The number depends on disease condition.